Moving time: 7 hr 10 min. Weather: 72°F in the morning with a high dew point; got up to 92°F by 3:00 at end of ride. Partly cloudy in the afternoon. The humidity actually dropped as the day progressed and as I gained altitude. How nice are Baptist ministers in Missouri? I did a lot of miles today in the Ozark Mountains. This was the second highest mileage day for me but I actually traveled the greatest straight line distance of the trip so far (68.3 miles). 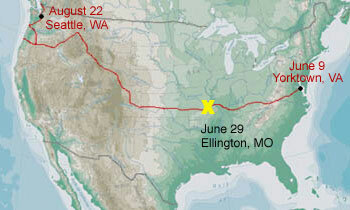 Unfortunately the route headed south-southwest so I didn't make a terrific amount of westward progress. I rode the world's longest roller coaster today. 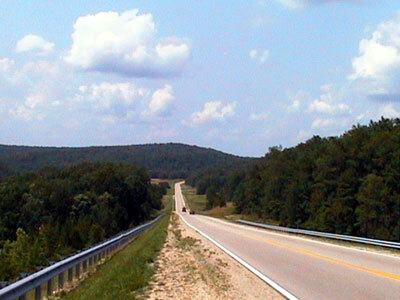 It runs between Ozora and Pilot Knob, Missouri - about 40 miles of up and down. It nearly made me sick to my stomach! Most hills were those 50 foot drop, 50 foot climb type. I can nearly make it to the top without too much trouble if I get a good run down the front side of the hill. All told I did about 3000 feet of roller coaster hills and the other 2000 feet in long, gradual climbs and descents. The Ozarks are overrated like the Poconos of Pennsylvania. They don't really have any mountains here - just a plateau with bumps on it. I haven't found riding in the Ozarks to be as difficult as some bicyclists and the locals would have you believe. They are much easier than the Appalachians and go pretty quickly. There were some steep sections but they were usually quite short. The longer climbs were usually not so steep. Here's a picture I took of one of those gradual climbs between Centerville and Ellington. The highlight of the day was Elephant Rocks State Park. 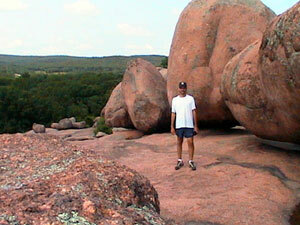 It is a very neat place that features a really cool geologic formation unique to the area. The park was about a mile off route but well worth the side trip. 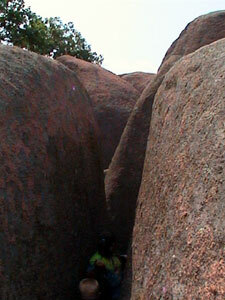 Giant boulders of 1.5 billion-year-old granite stand end-to-end like a train of circus elephants, hence the name of the park. 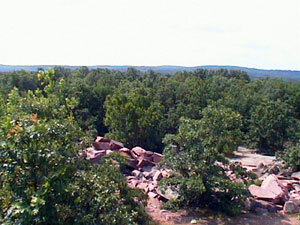 There are dozens of these large, red granite boulders strewn throughout a seven acre area, many of which are on top of a knob overlooking the valley below. 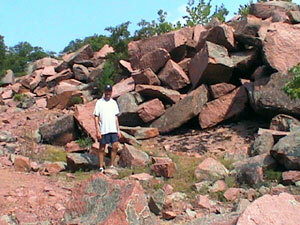 Other rocks at the park are remnant granite blocks that were chiseled away from the hillside by mining companies. Granite quarrying and memorial companies are a common site in the surrounding region. The nearby town of Graniteville was largely built by quarry companies that have operated here since the late 1800s. 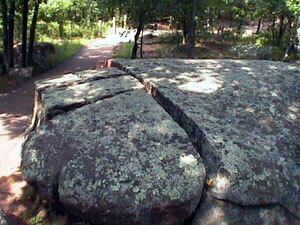 The hotel, post office, store, railroad depot and numerous homes are built from this long wearing, red granite. 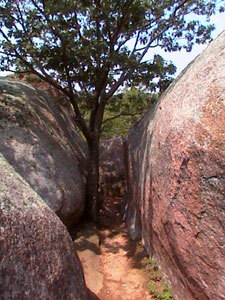 An interpretive trail with braille trail markers loops around the perimeter of the "elephants." 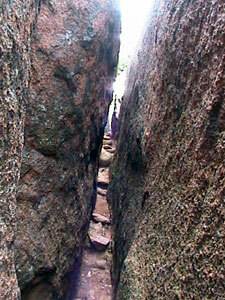 Just as I was about to leave a group of visually impaired youngsters were heading up onto the trail. I got talking to some of their escorts and they asked me to tell the group about my journey. I did so and they all checked out my bike - with their hands, of course. I've never seen so many people handle a bicycle at once before. They told me that they went on some bicycle trips recently, riding stoker on tandem bikes. It was a unique learning experience. 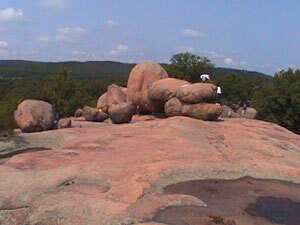 The following pictures were all taken at Elephant Rocks. The drivers here in Missouri are absolutely terrible. They don't give a rat's behind that there's a bicyclist on the side of the road. Most of them just go screaming by at 60 miles per hour and give very little right of way. It's almost like I'm not even there! The other three states' drivers were overly cautious when it came to passing me. People also yell out their car windows, "Get off the road!" or "Get a car!" The lack of paved shoulders adds to the problem. Often the edge of the pavement drops off into grass or loose gravel which is even more dangerous than taking on the drivers. A hotel owner I talked to in Ellington, who is not a native, confirmed my suspicion that people think they own the road. He says that same attitude carries over into their personalities. The few people I've talked to here in Missouri seem nice but I haven't talked to many since they are not quite as outgoing and friendly as those in Kentucky and Virginia. Oh, well. Cyclists say that Kansans are the nicest people on the trip and they are only three days from here! One driver who actually gave me some room was a dude named Matt. He was driving an early 90s Toyota Corolla and worked at a camp by Johnson's Shut-Inns State Park. How do I know this? Because his car was blowing blue smoke behind it when he passed me and it broke down about a minute later. I stopped to help out (like I could do much for him) and looked at the engine. He had it inspected and had the oil changed yesterday. He shredded a belt today. The oil pump seized up and was spewing oil onto the engine block and the belt came off the accessory pulleys. That probably explains the oil light, the battery light, the "check engine light," the brake light and the loss of power steering. I offered to make a call for him when I got to the next town which I gladly did. I would have usually given him a ride but didn't feel bad not being able to take him with me. The day was scheduled to end in Centerville, Missouri but the camp sites there were overrun with ATV riders who just got back from a beer run. I didn't think they would call it a night any time before midnight so I went down to a cafe to have some food. The owner told me that I could stay in front of the courthouse and take a bath in the river. I wasn't so sure about that - the locals seemed a little too crazy and I didn't want to be messed with. Besides, the rivers here are absolutely clear - I wouldn't want to foul them up with my awful stench. This is part of the Ozark National Scenic Riverways area and the streams and rivers here are protected waterways and are beautiful. The owner also asked to see Donna Ikenberry's book that I had sitting on the table. She was happy to see Centerville in print and told me that the other cafe is now closed. I stopped by the hotel in Ellington and pulled up just before a car that also showed up. I was nice enough to hold the door for the gentleman who got out of the car. He asked the person working at the desk if they have any rooms. They had one left. The man I held the door open for said, "I'm in luck then." I was taken aback since he knew I was traveling by bike and I arrived first. I piped up and asked where the nearest hotel is and it turns out to be 30 miles away. I hoped that the man in the car would give me the room and spend a little time driving to the other hotel. He didn't but I didn't beg for it either. I went outside to figure out what I was going to do. Ride on to the next town? Stay back at the crazy campground? Find a front yard to stay in? Camp along side the road or in the woods? The man in the car came out of the hotel happy that he got the room and told me that he is a Baptist minister in town for a meeting of some sort. A minister. Well, I decided to stay in the city park and rode away. The city park is pretty decent here in Ellington. There are no pool or shower facilities so I'm just going to have to put up with my own stink until tomorrow night. The bathrooms are horribly disgusting. At least there is running water so I can drink and cook. I hope to get a hotel tomorrow but things are pretty busy around here since it's a weekend near the 4th of July and people are flocking to the Ozarks like the New Jersey "lemmings" who flock to the Poconos every weekend. I'm not sure why any of them do it. I saw some armidillo and anteaters as road kill today - at least that's what they looked like to me. I'm not a biologist and can't vouche that this is part of their habitat. There were also lots of raccoon and turtle road kills too. I didn't change the time zone in my GPS until after today's ride so all the times in the data that I downloaded and will put into a spreadsheet later will not be correct for the past few days. I'll have to make the adjustment later. Towns are getting to be scarce around here. Most towns have a greater elevation than their population. There are only three towns with more than 1000 people between here and the Kansas border (230 miles or so). An older gentleman stopped by to chat at the park. He was riding a four-wheeler while his dog trotted along beside him. He's on permanent disability from his career as a lead miner after a fall in a mine - the elevator cable broke and it free fell 400 feet down a shaft. Of the three people in the elevator car, he was the only one to survive. He told me how terrible the upcoming hills will be. We'll just see about that. They seem proud of their "mountians" around here but I've yet to encounter anything that's nearly as rough as eastern Kentucky or western Virginia. There is only another day or two before I hit the flatlands of western Missouri so I can't imagine that things could be too bad. Some other ladies stopped by too. They say that they've seen bicyclist come through town but never knew where we were coming from or going to. They almost couldn't believe that their little town was part of such a route across the country. What a novelty is was for them to see their town name on the route map. It suddenly made them feel like their town was important!